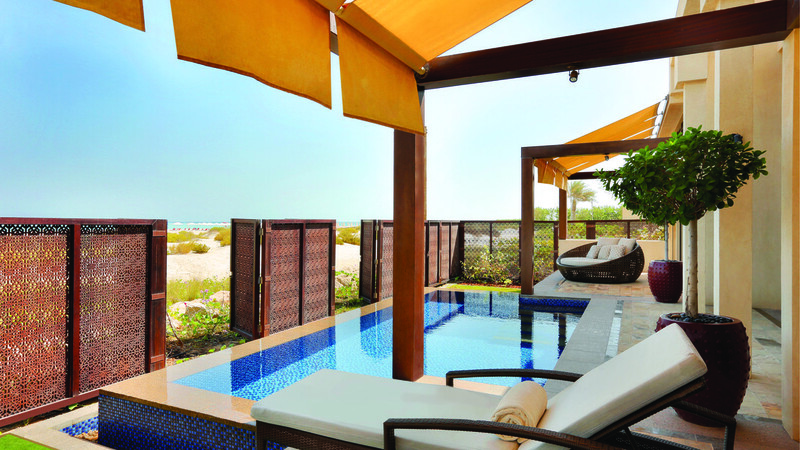 Enjoy a 5-star offering from the highly regarded Hyatt brand right in the heart of Abu Dhabi. 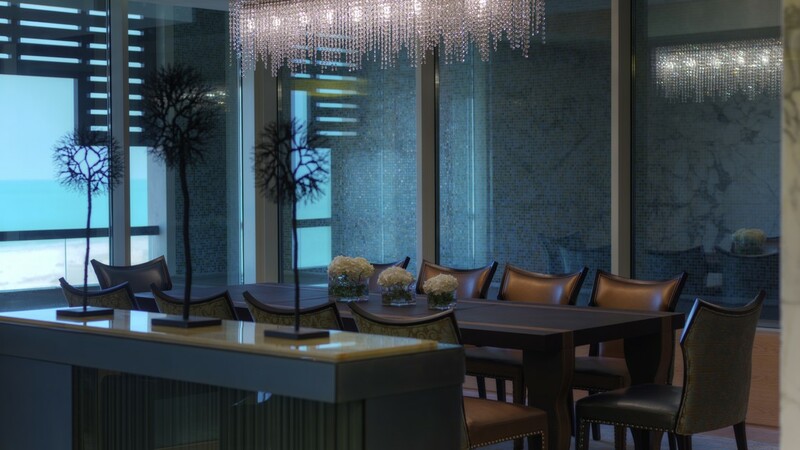 Considered a jewel in the Emirates, Park Hyatt reflects on this with a wealth of provisions drenched in chic elegance. 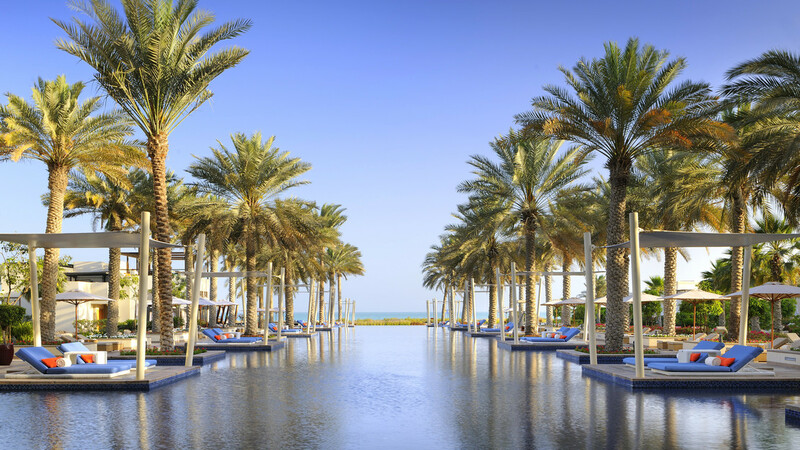 Nestled on the white-sand beach of Saadiyat Island, relaxing, family vacations are the theme with rooms and suites equipped for spacious family living, privacy and the utmost of comfort. There are waterfront villas with two- and three-bedroom designs, contemporary and unique suites with lounge and separate bedroom areas plus large outdoor spaces, and of course a range of carefully thought out provisions. Experiences include anything from award-winning spa rituals steeped in ancient Arabian techniques, to outdoor swimming basking beside crystalline waters and marine trips around several coastal retreats. Of course the children have access to the thrills and spills of Park Hyatt's Camp Hyatt and then there's fitness and frolics for all the family too. Make your Abu Dhabi stay a memorable pleasure with the services and 5-star offerings of Park Hyatt Resort. Around 50 square metres of space begins the accommodation categories in Park Hyatt. It may be classed as standard but it's far from it with a seating area, marble bathroom with double vanities, plush king-size bed and furnished balcony. 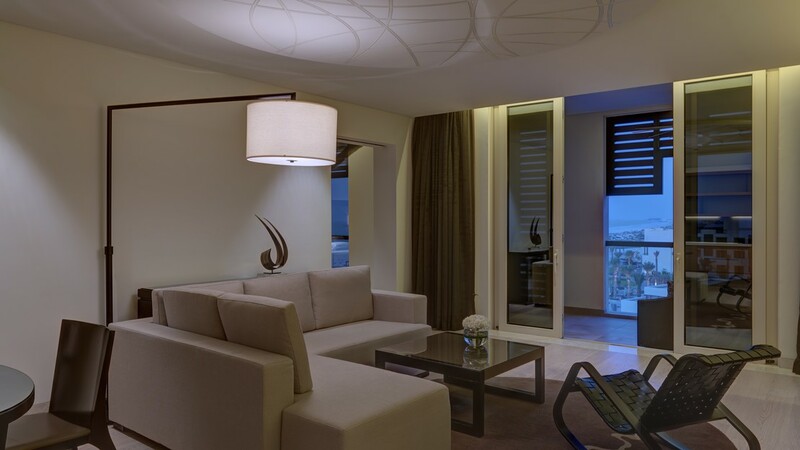 Enjoy the views of the Arabian Sea from these rooms featuring approximately 50 square metres of space. Signature bath amenities compliment the high-end finish of the beautiful ensuite and the comfortable king-bed and array of modern amenities add plenty of style to this room choice. Going up a level and Park Hyatt offers the suite range impeccably furnished to a high degree. 100 quare metres envelops touches such as a separate living room and bedroom, two large balconies overlooking the Arabian Sea and Saadiyat Beach as well as the resort pools. The elegance and style of this category is something rather special. Additional provisions include daily buffet breakfast, fruit water and complimentary newspapers. A little more space is offered with these suites and the same high-end design. A living room and bedroom, and an indulgent private pool, complete the layout and there's wonderful views of the Saadiyat Beach Club and hotel gardens or beachfront. A generous 150 square metre design incorporates a stunning bedroom that's separate from the main living area and also a massage bed and sun loungers on the spacious outdoor terrace overlooking the sea. Located on the top-floor this suite promises to be spectacular! Relax in 130 square metres of space and enjoy privacy and comfort to the highest degree. A bedroom separated from the living quarters by mirrored doors and two large balconies offer plenty of indulgent space. There is also an open-plan Chinese lava wave marble-bathroom adding to the appeal. An indulgent design, the Prince Suite epitomises Park Hyatt's luxury theme and displays contemporary style and cultural influences. Relax with panoramic views overlooking the beach and sea from the top floor of the resort accommodation. A large living room, bedroom and expansive balcony make up the interior design and there are enhanced pampering touches such as daily buffet breakfasts, and the choice of interconnecting rooms and suites. The height of luxury, enjoy a top-floor stay in 275 square metres of pristine decor and living with a spacious lounge, separate bedrooms, dining area to seat 10 and of course multiple bathrooms, and private steam room. There is a separate butlers entrance and the outdoor space is just as impressive with room for a plunge pool, terrace and outdoor massage area. Starting at 200 square metres and increasing to 355 sq.m in the Royal Villa, these one-of-a-kind standalone villas are perfect for added privacy and indulgence. 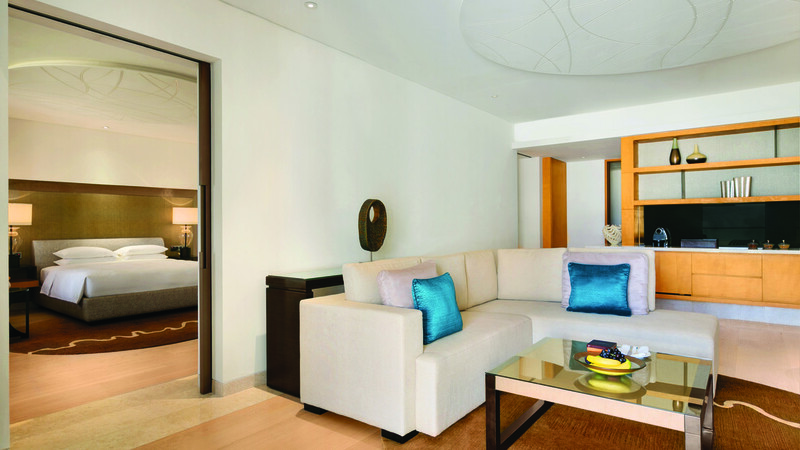 A spacious living area, master bedroom and one or two further bedrooms, a maid's room with separate entrance and ensuite plus an outdoor space that adds to the wow factor ( boasting a private plunge pool, massage beds and dining terrace), these are some of Park Hyatt's very best accommodation choices. Begin a worldwide culinary journey without leaving the resort with the finest and most carefully crafted dishes at Park Hyatt Abu Dhabi. First-class chefs prepare skilled delights inspired by the Med, Asia and everything in between. It's sure to transport your taste-buds through memorable journeys and more. Charcoal-grilled meats and seafood dishes are presented here where theatre-style kitchens add to the grandeur. Enjoy all things Middle-Eastern in a contemporary setting at The Cafe. The flavour of the Med are showcased in this stylish venue. Perfect for happy hours and sundowners, this is a complimentary venue to the number of restaurants onsite. Home-made chocolates, pastries, sweet treats and more compliment the rich array of specialty teas and coffees served in this lounge setting.